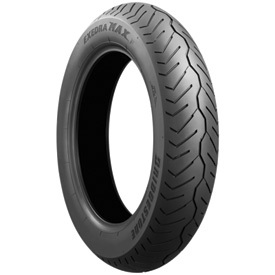 The Bridgestone Exedra Max Motorcycle tire features a unique wide shaped profile that supports touring type riding with less fatigue. With its specific rubber compound you will see much better mileage. Great in both wet and dry conditions providing confident grip in all riding weather. Specific rubber compound for cruiser applications provides long mileage. Unique wide shape of tire profile supports touring-type riding while reducing fatigue. Rubber compounds and tread patterns enhance water evacuation and both dry and wet grip. Holds the road great , Dry or Wet. Haven't put a bunch of miles on it yet but I did do some good long runs on this tire and it seems to be very good so far.Only time will tell how long this tire will last. Found Rocky Mountain ATV/MC to be very prompt with delivery of tire. In addition, I received an email letting me know that there was a rebate on tire and that all I had to do was fill out information that dealer had attsched to their email. Great price, tires grip well in dry and wet conditions. Great service from Rocky Mountain. Replaced my OEM Dunlop tires on my 2014 Moto Guzzi California 1400 Touring with these tires. I have put just over 1000 miles on them so far. The bike handled great on a recent trip to the mountains. The tires have good grip in both dry and wet conditions. They were much cheaper than replacing with the ORM brand. The customer service at Rocky Mountain was great. Would definitely buy these tires again from Rocky Mountain. Had dunlop tires on before, tread life not very good, grip makes you doubt the tire, felt the road snakes. The bridgestone tires give you confidence. Yes i would recommend these tires. Great value for the price of tires recently. -m-2001 KAWASAKI Vulcan VN800A-- just recieve the new tire, but the bike had the same tires on it when it was bought. And lasted well up to the wear limit, with no complaints. So decided to stick with the same tire, for value, and handling purposes. You don't get enough miles on it. Surprisingly I wore it out before my rear on my Concours 1000, but I'm at 12,000 miles and still have a couple thousand to the wear bars, so I can't complain. They asked me to say something about my tire that i got from, well first of all the service was OUTSTANDING they know what they are doing, i am going to get a back tire soon and i'll get it from them, about the tire i put the order in on a Wednesday got it that Friday before noon and no shipping charge THAT IS GREAT i have told all my riding buddy's about you, keep doing what you do, i am on ssi live on a budget so this helped me out so i thank you. Much better than the OE Dunlops on my sportster, better grip, smoother ride, handles much better. This is the first time I have ordered from Rocky Mountain and I am very pleased with the service and the speed of the delivery. I have used this product for some time and have always been very happy with it. Can't believe how much nicer these tires are them the Dunlop's. Ride is great feels safer. Just put on but love the way they handle, Bike feels like new. GREAT tires, great deal Above average mileage with excellent handling! Does a great job, hold the corners well. 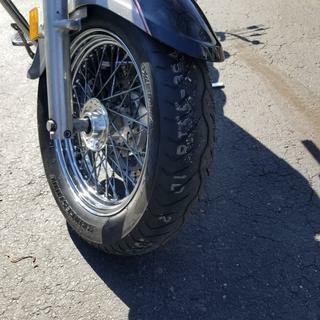 I have had this tire 2 different times and it really hooks up good on a heavy bike. I have a Kawasaki Vulcan 2000 and this is a great tire. I have used it with 2 different rear tires and it works great. The matching rear hooks up just as good but it lacks the mileage. You won't go wrong with this tire as long as the rear is a radial. Can this tire be used with a tube? It is a tubeless tire but I guess you could use a tube but may be hard to get the tire to seat right. Yes you can put a tube in the tire. Yes it can be used with a tube.